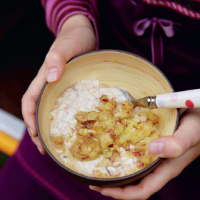 Apple muesli is perfect for camping – it’s easy to make and can be eaten warm or cold. 1. Place the porridge in a bowl and pour over the apple juice. Mix together, cover and leave in the fridge to soak overnight. 2. In the morning, mix the muesli into the yogurt and divide between 4 bowls. Grate the apples and stir with the honey, then spoon over the muesli and serve.